BOURNE, Mass. – Three periods wasn’t enough to separate Mansfield and Franklin boys hockey when the two met in the regular season. It wasn’t enough in the playoffs either. 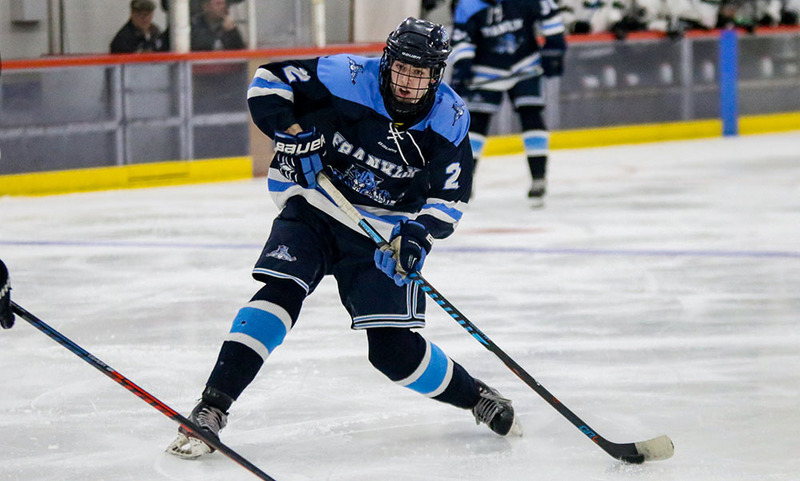 After finishing level in their Hockomock League showdown back in January, the Panthers and Hornets were deadlocked at 2-2 through 45 minutes in their D1 South Quarterfinal clash. Franklin senior Scott Elliott emerged as the hero, scoring the game-winning goal with just 1:24 to go in the four-on-four overtime period, giving the 11th-seeded Panthers a 3-2 win over third-seeded Mansfield. “There was a battle behind the net and I was able to get their guy off of me,” Elliott said. “I saw the goalie go the other so I just tried to spin around the other way and go five-hole it worked. While Mansfield got the first shot in the six-minute overtime period, a bid from Jack Garland that was denied by Ray Ivers (24 saves), the rest of the extra frame belonged to the Panthers. Defensemen Cam Cassella and Tom Tasker had low shots denied by Mansfield junior goalie Sean McCafferty (25 saves) just seconds apart. Then McCafferty prolonged the game with back-to-back stops, denying Shane McCaffrey with a point-blank pad stop, and then turning away a bid from Colin Hedvig. The Panthers finally solved McCafferty in the overtime period when Elliott took a feed from CJ Spillane and was able to shake off a defenseman behind the net. Elliott faked to wrap around to the left but instead went back to his right, stuffing a backhand attempt in for the winner. “Our guys had an extra gear in that overtime,” said Franklin head coach Chris Spillane. “Shane McCaffrey played a great game, Scotty Elliott was outstanding as well. It was a great hockey move to win a game, he’s played like that all year long for us so it was good for him to get that. After a back-and-forth start to the game, the anthers were able to grab the lead just over the midway point of the first. Tasker whipped a clearance up the right side of the ice, and the puck eluded the Hornet defenseman at the blue line, leading to a two-on-one chance for the Panthers. McCaffrey jumped on the puck and carried it into the offensive zone, tossing a pass to senior Joey Lizotte. The past was a little behind Lizotte, forcing him to pivot to gain possession, but it didn’t stop him from returning the pass back to McCaffrey, using a nifty backward pass. McCaffrey hit a one-timer from in close to put Franklin up 1-0. Mansfield responded less than four minutes into the second period to tie the game. Freshman Brian Grant made a nice play at the blue line to prevent a Panther clearance and batted it down the walls to Garland. Garland turned a whipped a low shot towards that that found its way in to make it 1-1 with 11:15 left in the second. After a clean first period, the Panthers were plagued by penalties in the second period and the ice tilted in favor of the Hornets. Mansfield didn’t convert on their first power play chance when the Hornets were whistled for a hook with 10:10 to go in the middle period, but the Hornets did cash on when given a second opportunity five minutes later. Jake Lund had a chance right on front that was denied but the Hornets continued to apply pressure. Grant fired two straight shots from the blue line that were over the net, but his third chance about a foot off the ice and sophomore Matt Copponi redirected the puck as he skated across the middle, giving Mansfield a 2-1 lead with 4:10 to go in the second. The Hornets went on the power play for the third time in the period with 2:40 left but couldn’t increase their lead. Franklin knotted the score at 2-2 with its first real chance of the final period. Kyle Hedvig carried the puck behind the goal before dropping the puck in front for a one-timer from Lizotte to tie the game with 9:41 to play in the third. “It was a hell of a game, it really was,” said Mansfield head coach Mike Balzarini. “We were tired there in overtime, maybe too long of a shift. We tried a couple of different looks but with that long change, it was tough. But I thought we played well, we killed off that late penalty, we had a couple of chances shorthanded, and we seemed to have the momentum, but in the end we just didn’t have enough. McCaffrey nearly put the Panthers ahead at the midway point of the third. On two occasions, the junior took the puck the length of the ice, beating a pair of Hornet defensemen on the first trip but his wrist shot was turned away. Mansfield took its first penalty of the game with 3:03 left on an interference call, but the Hornets were able to prevent Franklin from going ahead in regulation. Brad Grant blocked a shot early, leading to a clearance from Lund. McCafferty came up with three straight saves, including one on a blast from Tasker. After a shot from Cassella, Kevin Belanger came up with back-to-back clearances to kill time. The Hornets earned an offensive zone faceoff with four seconds left in the game but Spillane won it straight back, and regulation came to a close. In overtime, the Panthers had the edge on experience after playing in similar situations twice during its holiday tournament at Mount St. Charles. Along with the experience from in-season, Franklin has practiced for overtime since the beginning of the tournament, including getting the defense involved in the offense. Mansfield finishes the season at 14-6-3. Franklin boys hockey (11-9-4) will take on #7 Catholic Memorial in the D1 South Semifinal on Wednesday, at 5:30 back at Gallo Ice Arena.